We are born with distinct qualities which make us different from one another, but most of the many people are born with a sense called aesthetics. Yes, it is not only about admiring the beauty of nature, praising whatsoever one sees, but it is connected to the intrinsic power of mind and heart. We are born with this sense of understanding things as they are, we create the beautiful aspects out of nothingness and this is how one should always put forward optimism. Also we should keep a rain check and remove our inhibitions that stop us to take up the challenges. Remember, the ones who fret over and get intimidated can never achieve the insurmountable. So be courageous, admire what life throws at you and surpass all the hurdles. Learn to rejoice yourself with the beauty you see around, the beauty of the work you do, the significance and efficacy of it, and all that comes along. Not only artists and designers, but a layman too has been occupied with the sense of appreciation. When we talk about food then surely we look at the way it is presented to us by the chef, how well the table is lit, how aromatic the dish feels, the colors and refreshing outlay just makes our mood going over to the moon. So of course when a designer makes a packaging design of an eatable or of a beverage he keeps a check that what striking and appetizing elements he could imply while making the packaging of the eatable. When it deal with coffee beans, dry fruits, candies, bunties and colorful macaroons then the tuck lid window box is preferred so the window could reflect and showoff the prettiness and glitz of the eatable/preserved food. 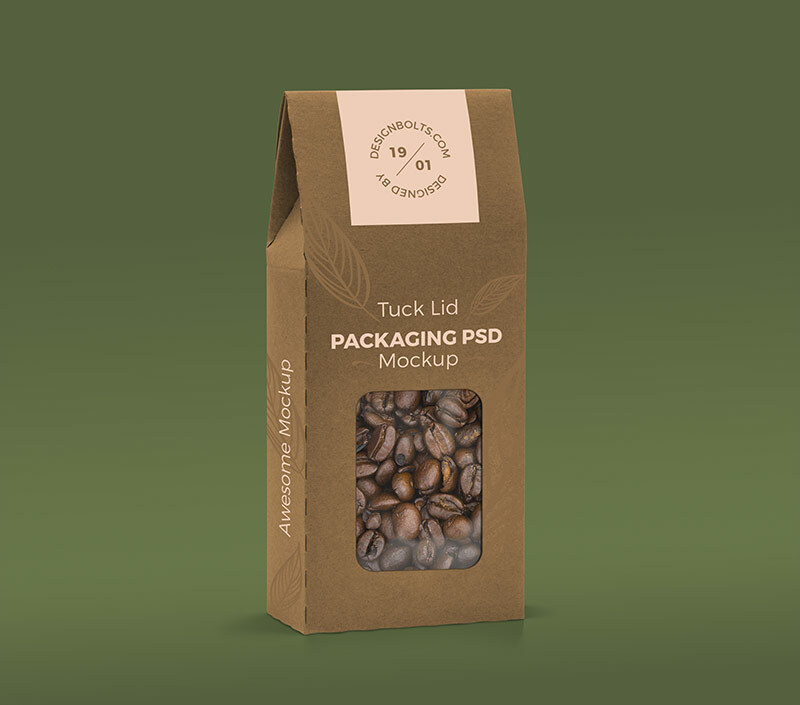 Down here I am putting forward tuck lid window box packaging mockup in which you can insert in your own design elements and it is ready to serve the purpose of a stunning presentation made for your client. Great mock up, beautiful! Thank you!